There’s no better way to enjoy the final fleeting days of summer than with a leisurely brunch, and the West End’s newest eatery is obliging with its new low-key weekend brunch service. 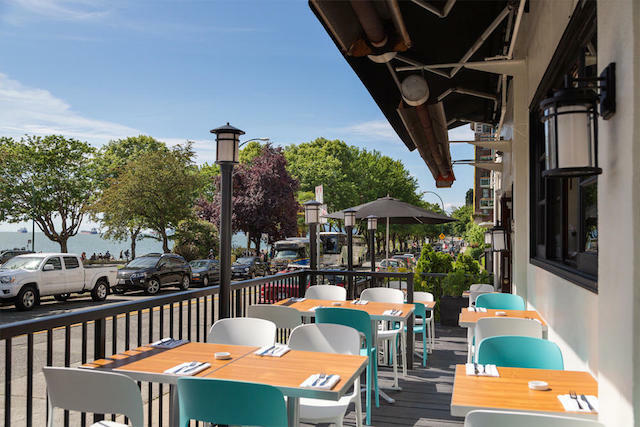 Beach Bay Café and Patio, the newest eatery to join Vancouver’s bustling breakfast scene, offers guests the best seat in the house wherever they dine. Soak up some natural vitamin D on the spacious patio, or kick back in the light and airy dining space. Either way, weekend visitors can enjoy a panoramic backdrop of English Bay beach. Guests can satisfy their appetites with a variety of West Coast-inspired delights from the brunch menu, including an appetizer of apple cinnamon beignets; classic eggs benedict topped with your choice of honey ham, tuna confit or grilled kale and mushrooms; a crispy chicken burger with potato salad or French toast topped with fresh blueberries, candied walnuts and a bit of milk chocolate. Thirsty brunch fans will also find a plethora of cocktails and breakfast beverage blends to pair with their delectable dishes. Start your Sunday brunch off right with a hearty Mezcal caesar, complete with clamato juice, tobacco, lime and sumac. Or for more refreshing mixes, sip on an aperol spritz or bubbly Beach Bay mimosa. Non-alcoholic options include several select juice blends, such as carrot, apple and kale. Beach Bay Café and Patio is now open for brunch on Sundays from 11 a.m. to 2 p.m. For more information or for reservations, call 604-685-7337 or visit beachbaycafe.com.